We could try to make artful metaphors to describe the appearance of Infiniti’s current QX80, but nothing we or anyone else could say will take the edge off seeing the bulbous SUV in person. A small percentage of car buyers might find the rig’s appearance inoffensive, but everyone else will call it like they see it: ugly. 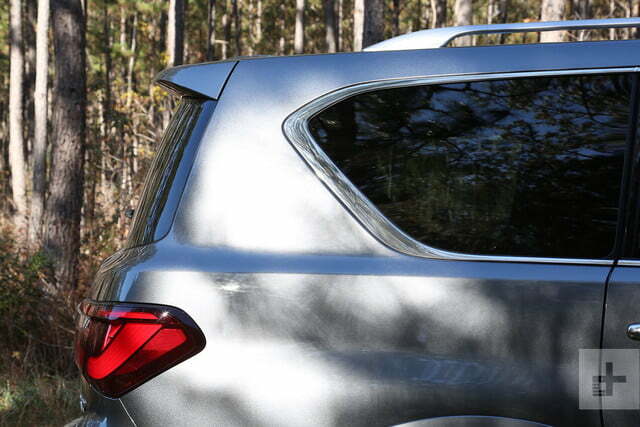 The QX80’s unsightly aesthetic is a real shame, too, because most everything beneath the surface is stellar. “Don’t judge a book,” they say. 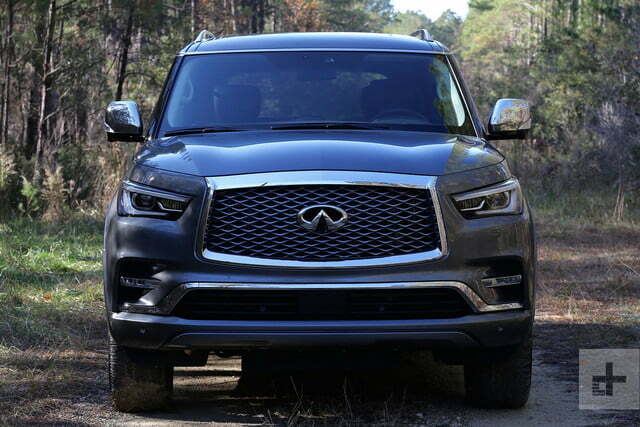 Fortunately, with the introduction of the face-lifted 2018 Infiniti QX80, we no longer have to be so visually sensitive. First shown at this year’s Dubai Motor Show and previewed by the QX80 Monograph Concept, the refreshed QX80 swaps sheet metal and refines its luxury goodies to better compete with rival full-size luxury SUVs. Does Infiniti’s range-topping model have what it takes to transcend its budget-conscious bracket? Digital Trends journeyed to Charleston, South Carolina to find out. 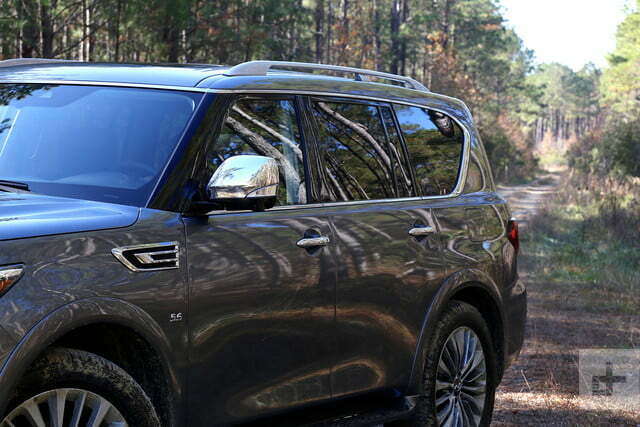 Read on for our full 2018 Infiniti QX80 first drive review. The current generation QX80 (formerly known as the QX56) has been on sale since 2010. Apart from some minor touch-ups, the SUV hasn’t received much attention – despite the rapid growth of its segment. Finally, the 2018 model year introduces style and substance improvements to elicit a second glance from luxury buyers. Chief among the changes is an exterior overall to fall in line with Infiniti’s latest design language. Other tweaks include a revised suspension, additional sound deadening materials, new interior trims and seating configurations, new leather and quilting for the seats, and a camera-based streaming rearview mirror. Unchanged is the SUV’s 5.6-liter V8 engine, seven-speed automatic transmission, and drivetrain. 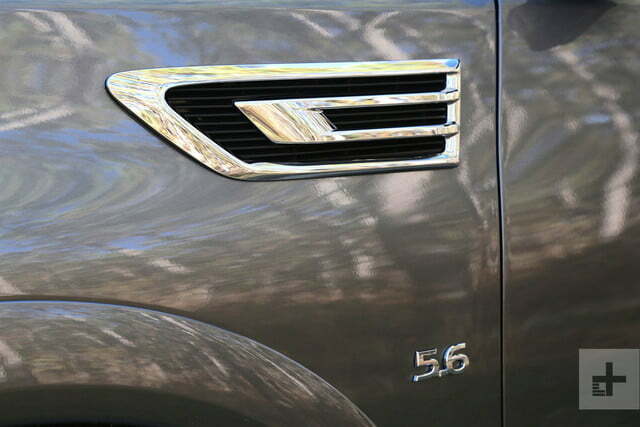 70 percent of statistics are made up, so here’s another one: half of the purchase decision for a full-size premium SUV is based on curb appeal. While we don’t have the numbers to back up this particular hunch, the anecdotal evidence is extensive. Cadillac glitzed up its Escalade, Lexus put a giant grille on the face of its LX, and Lincoln went upscale with its latest Navigator – all for the same reason: boldness sells. From the most disturbing to the most dashing, the new QX80 completely flips the SUV style rankings. 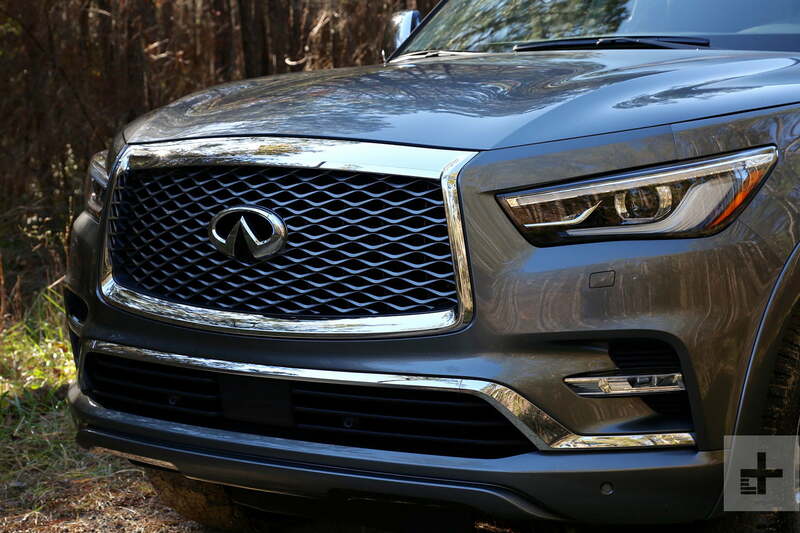 In redesigning its 2018 QX80, Infiniti needed to beautify and amplify the SUVs features. Fortunately, Alfonso Albaisa, Infiniti’s senior vice president of global design, has proven his talent time and time again. At Pebble Beach, the Prototype 9 Concept all but stole the Concours, and in LA, the 2019 Infiniti QX50 was one of the most talked about reveals. Borrowing the most fetching cues from the QX80 Monograph Concept, Albaisa transformed the SUV into one of the most attractive vehicles in the segment. Most notably, the current generation QX80’s whale face is gone – replaced by a more prominent “double-arch” grille, “human eye” headlights, a re-sculpted lower fascia, and a longer hood. 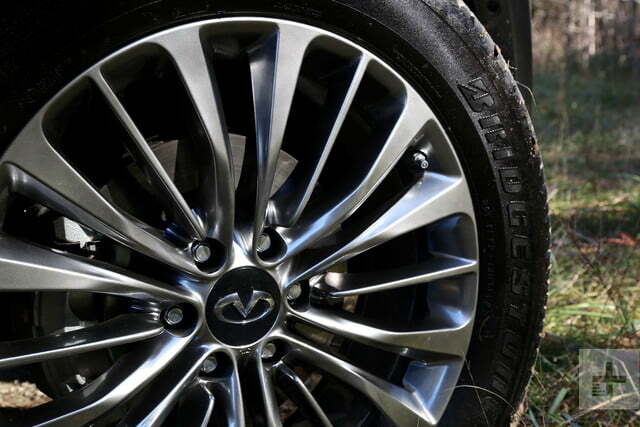 New standard 20-inch and upgraded 22-inch wheel designs pop among a more refined silhouette. 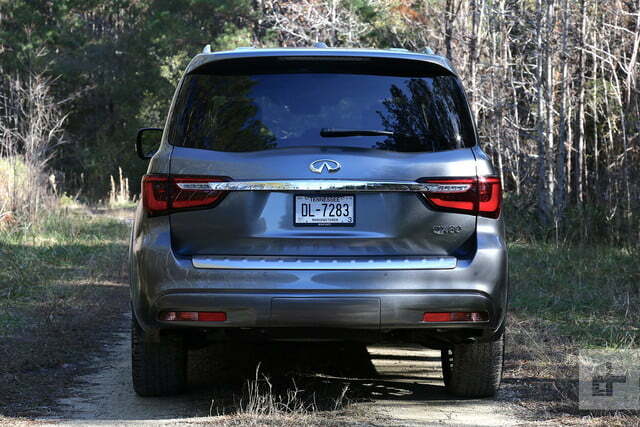 At the rear, an all-new lift-gate with updated LED taillights and a new bumper finisher freshen the full-sized rump. It’s a short list of exterior changes, yet the impact is substantial. 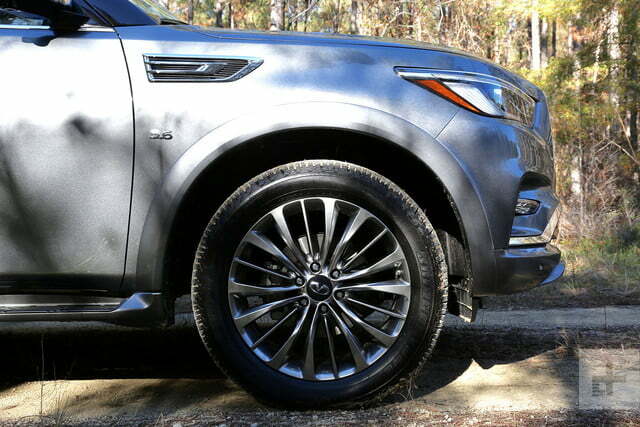 From the most disturbing to the most dashing, the new QX80 completely flips the SUV style rankings. 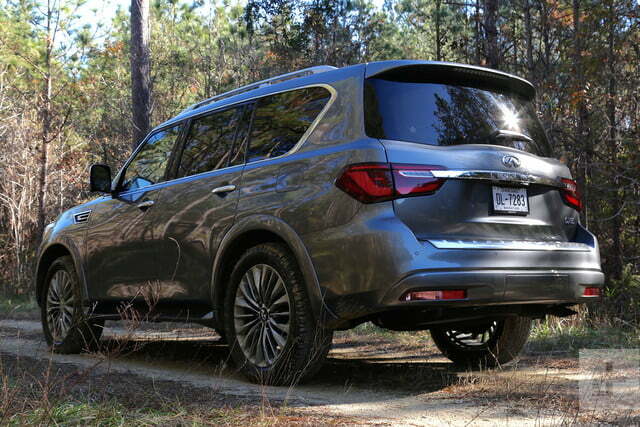 The 2018 Infiniti QX80 is offered in two trims. Rear-wheel drive versions start at $65,745 and four-wheel drive models bump the base figure up to $68,845 (both including destination). On top of these drivetrain designations, there are a number of optional packages. Available is the Theatre Package ($2,450), Split Bench Seat ($250), Deluxe Technology Package ($5,700), 22-inch Wheel and Tire Package ($2,800), Driver Assistance Package ($2,900), and Premium Paint ($500). 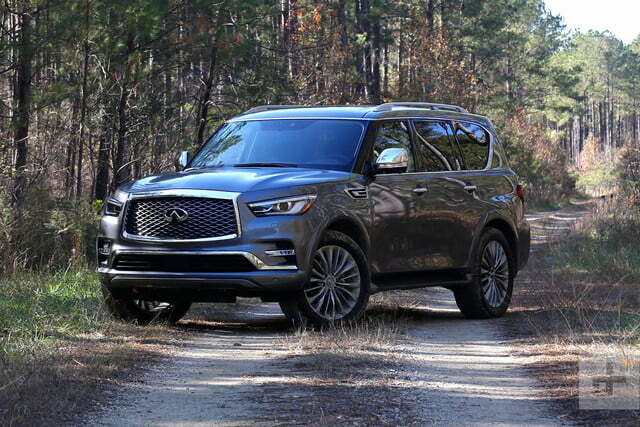 Infiniti says a QX80 with its most popular equipment will run somewhere in the mid-$70K range and a fully loaded model will retail for high-$80K. By comparison, a similarly priced Lincoln Navigator will set buyers back $7,000 more than the QX80 and a Cadillac Escalade will cost $9,000 more. With the right designer, small tweaks can make a world of difference for a vehicle’s exterior, but it’s impossible to cover up inadequacies when it comes to interior technology. Infiniti’s attempts to work around the larger issue of an outdated infotainment system include a camera-based digital rearview mirror, Amazon Alexa integration, updated rear seat entertainment screens, and a slightly sharper center monitor. 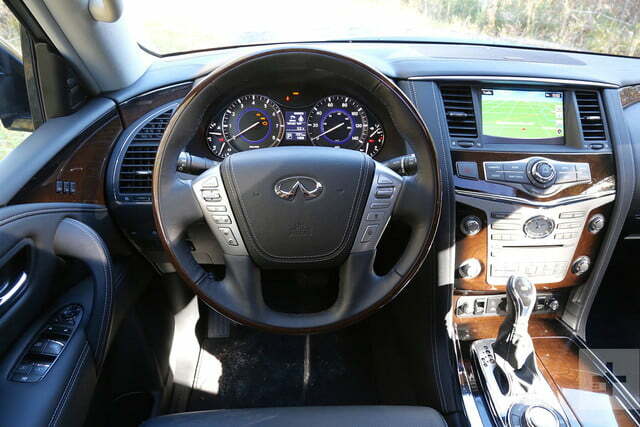 In 2012, when Infiniti’s current InTouch system was introduced alongside its Surround View camera system, the Japanese automaker was far advanced of the curve, but an 8.0-inch screen without Apple CarPlay and Android Auto just doesn’t cut it these days. Equally weak is the tiny, monochrome digital TFT display mounted between two massive gauges and the absence of a head-up display. Amidst an otherwise upscale, contemporary interior, these features are a real letdown. 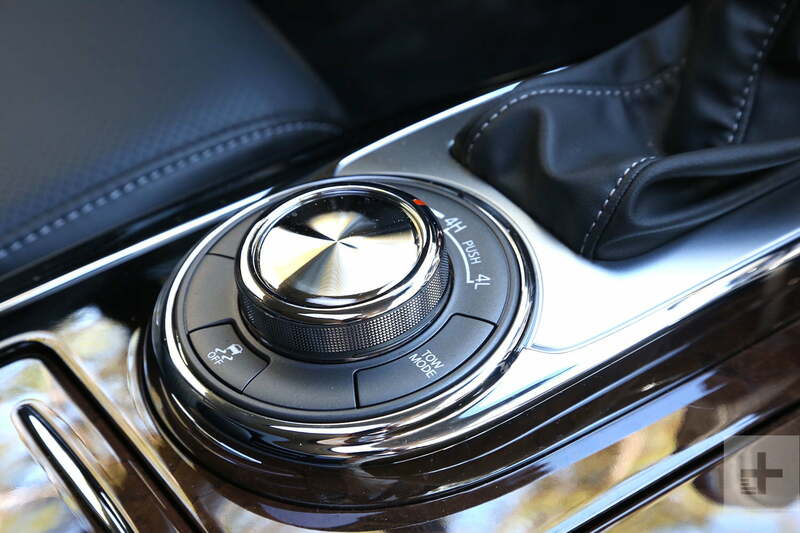 On a brighter note, the new QX80 adds two more USB ports for rear seat occupants, Wi-Fi and HDMI enabled entertainment screens, Bluetooth headphones, and voice command functionality. 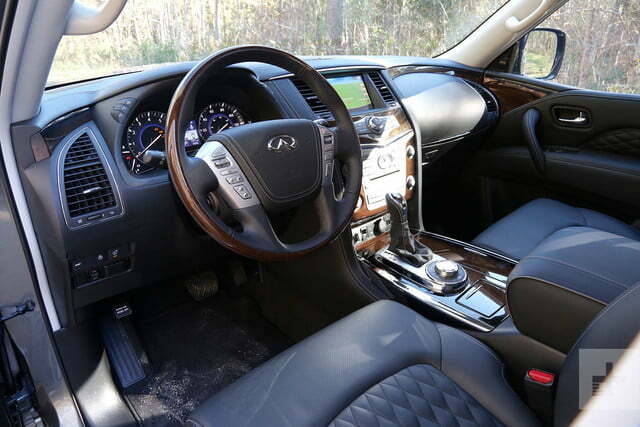 Inside the new QX80 is a familiar layout with a few key updates. The center console has been redesigned to accommodate a smartphone and handled-mugs, standard wood grain trim has been touched up, the seats feature a new quilted stitch pattern over a choice of two new semi-aniline leather colors (Wheat or Graphite), the rotary knob for drive mode selection has been redesigned, and the second row can now be equipped with an extended center console in place of the middle bench seat. 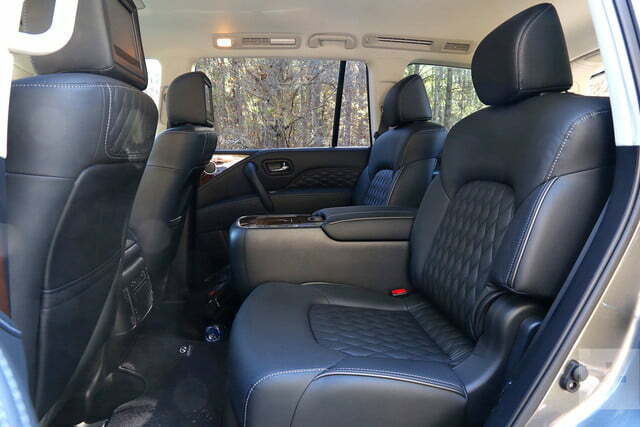 The QX80’s well-padded, soft leather chairs are without reproach; short or long journeys are spent in complete comfort as the QX80’s new, more absorbent tires and retuned suspension reduce cabin disruption from rough road surfaces. 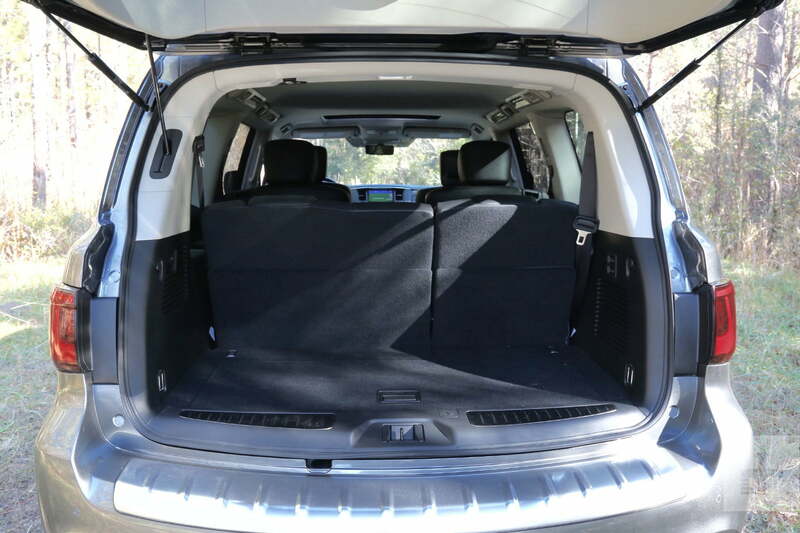 Enhancing passenger tranquility is the QX80’s hushed interior volume – minimal road and wind noise penetrates the truck’s sheet metal and additional sound deadening materials. Notably absent from the Infiniti’s feature set is a panoramic sunroof – a standard or optional component for each of the QX80’s main rivals. With as much surface area as there in between the front seats and the trunk, this omission is pronounced to rear riders. 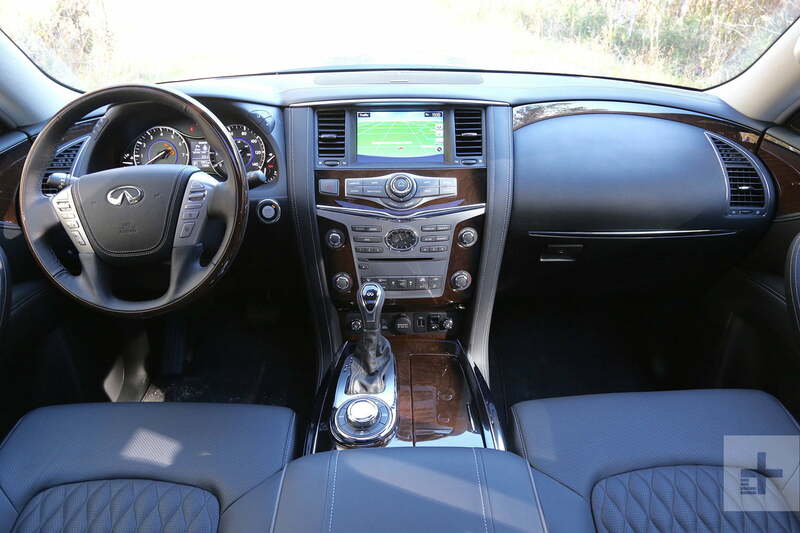 Whether you choose the eight-passenger configuration or captain’s chair/seven-passenger layout, the 2018 Infiniti QX80 affords 16.6 cubic feet of cargo volume behind the third row and a maximum of 95.1 cu. ft. with the second and third row’s folded. By comparison, the Cadillac Escalade (non ESV) offers 15.2 cu. ft. behind the rear bench and 94.2 cu. ft. of total storage. Besting both SUVs is the new Lincoln Navigator and its 18.1/103.3 cu. ft. cargo layouts. Decades of laboring, V8-powered trucks are sufficient evidence to prove that not everything with eight cylinders is fast. 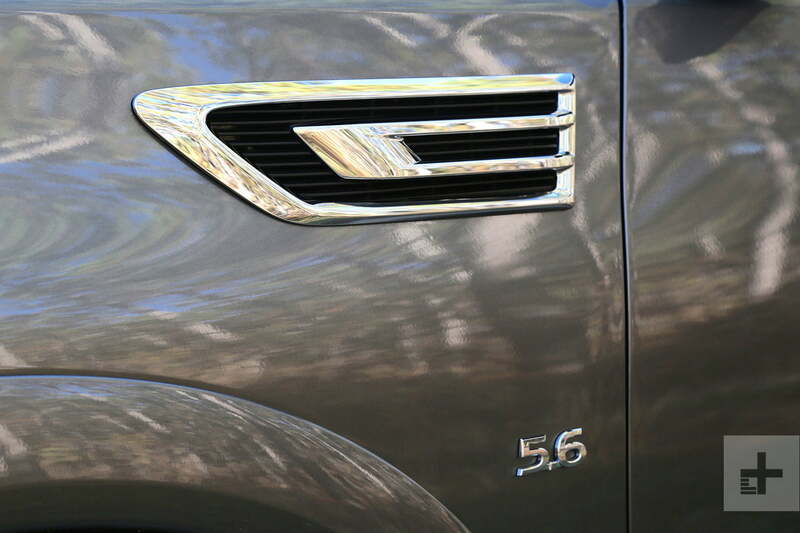 The telling metric is power to weight ratio – something the QX80 (and most of its competitors) struggle to overcome. 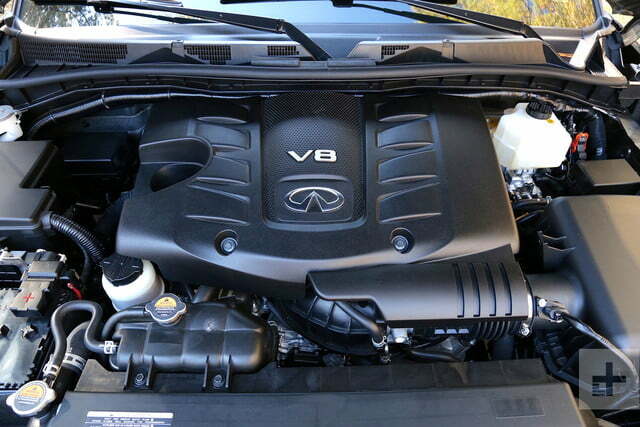 Propelling the 2018 Infiniti QX80’s 5,644 pounds (in RWD guise) is the same 5.6-liter V8 as last year. Un-modified, the mega motor still produces 400 horsepower and 413 pound-feet of torque, shoving the rig to 60 mph in 7.0 seconds and on to a top speed of 130 mph. 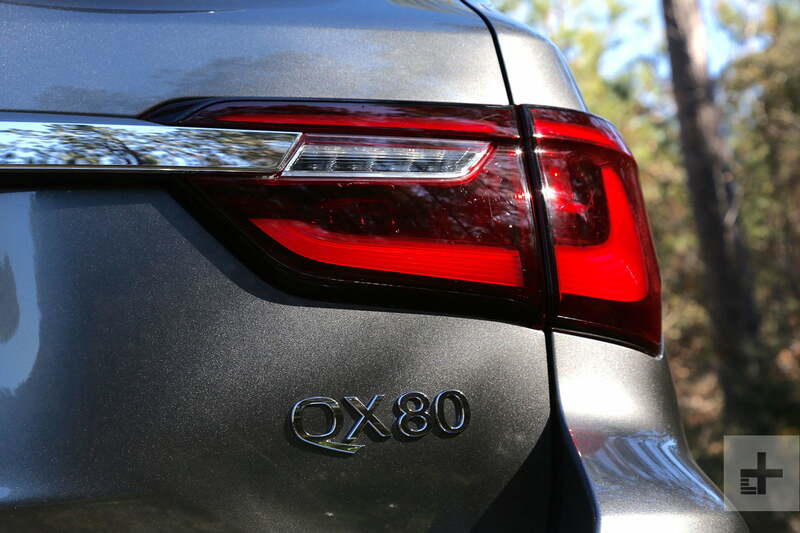 Among its key rivals, the QX80 makes the least power (down 20 horses to the Caddy and 50 horses to the Navigator), and is about a second slower to the 60 mph mark. 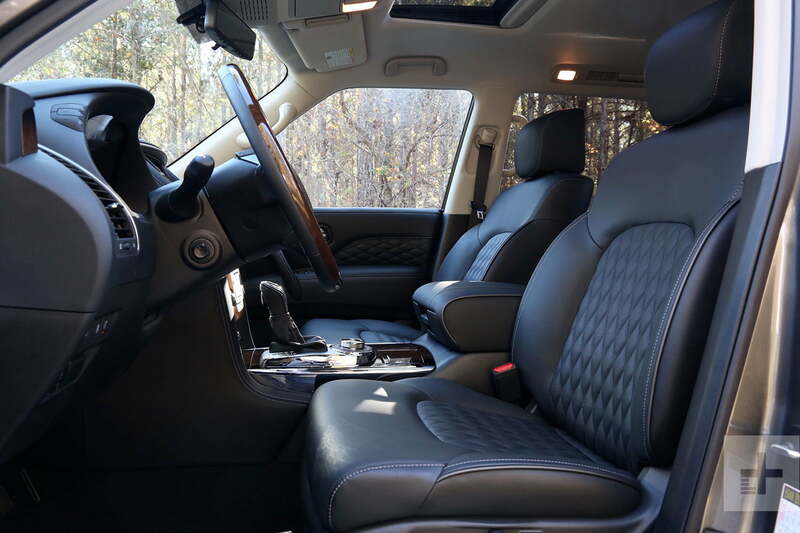 From the driver’s seat, the QX80’s on-paper losses are less pronounced. Lay into the throttle from a stop and the full-size SUV builds speed with sufficient haste. Mid-range jogs (from, say 50 mph) require a bit more patience, but the seven-speed automatic transmission downshifts dutifully to offer maximum available grunt. 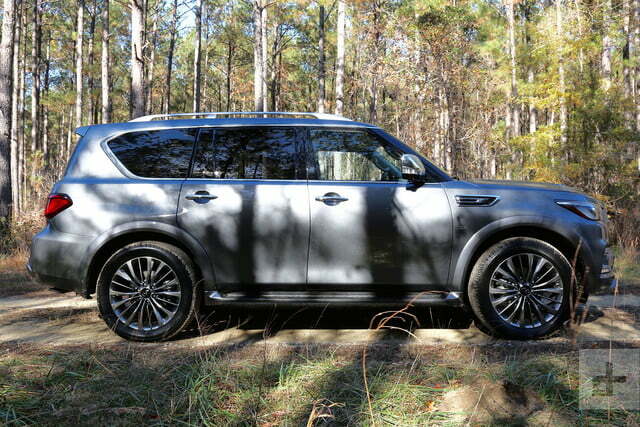 One might assume that the QX80’s segment-low power figures at least grant fuel economy advantages. Alas, Infiniti’s veteran V8 can offer no better than 14-mpg city, 20 mpg highway, and 16 mpg combined (15 mpg if you choose 4WD). Meanwhile, the Escalade promises 17 combined mpg and the Navigator, 19 combined mpg. 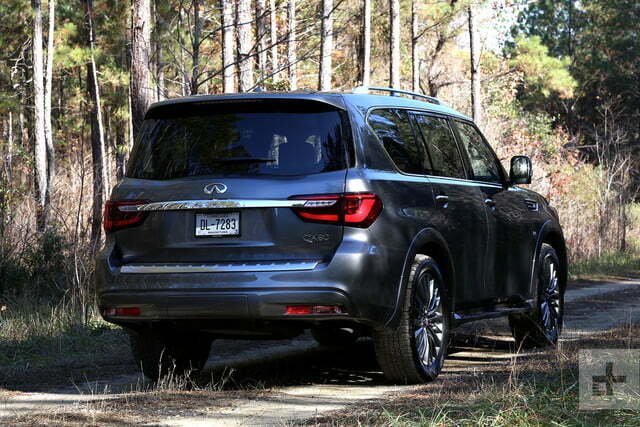 Infiniti’s refreshed QX80 is redeemed in part by impressive braking and handling. 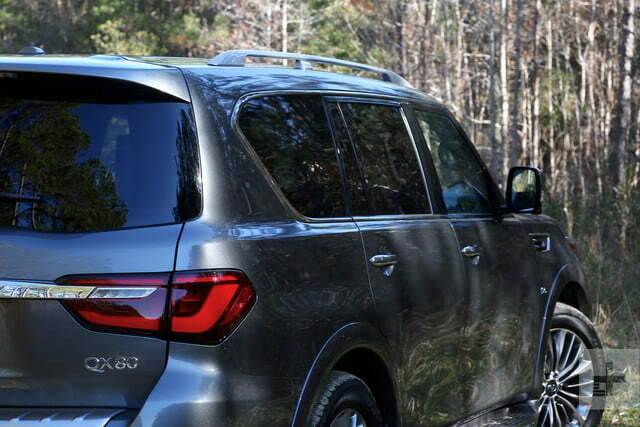 During 30- and 60-mph “panic stops,” the QX80 comes to a quick, stable halt with an admissible amount of front-end dive. Cornering is equally good thanks to Infiniti’s revised Body Motion Control adaptive dampers. Aggressive lateral maneuvers yield controlled rotation rather than flopping weight transfer – unlike typical body-on-frame SUVs.